My dogs love to travel! Their tails are always wagging with delight when they see things getting packed up, because they know something new and exciting is just around the corner. After performing at the Montana Fair we started to head east towards our next stop. 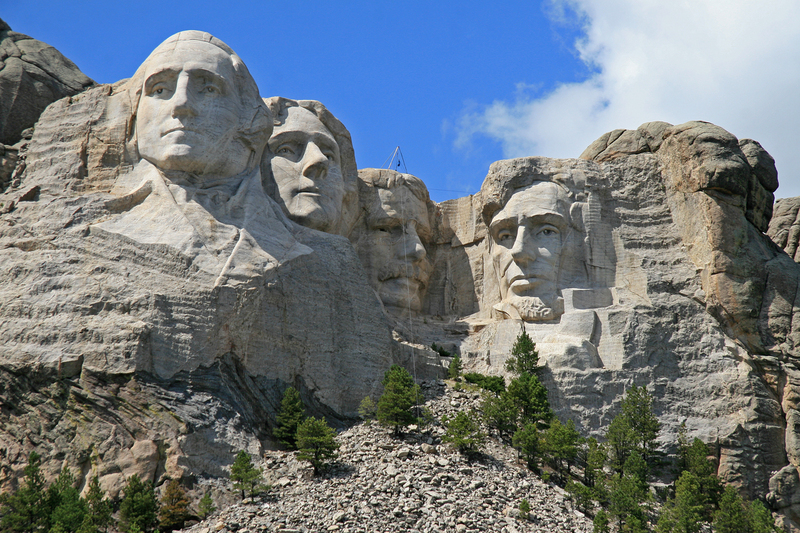 On our way, we decided to take a detour in South Dakota heading south on I-90 towards Mount Rushmore! When we rolled up to the main entrance I noticed a sign on the clerks window that said “No dogs allowed”. I took a deep breath and thought, “I didn’t come this far to turn back now”. So we continued inside the park hoping they wouldn’t notice the big dog logo’s on the RV. They didn’t say anything when I paid to enter, so I continued towards the parking area. I got extremely nervous after parking in the cramped RV parking lot. There didn’t appear to be anywhere to let the dogs out and they all needed to stretch and potty. I thought after seeing the “no dogs allowed” signs, I better ask the ranger if I could just let them out really quick. He was very friendly and directed me to the doggy potty area, which was just around the corner. That was a relief at least. It appeared dogs could come in, but they weren’t allowed anywhere else in the park or on the path up to Mt. Rushmore. They were confined to the potty area and your own vehicle. So to answer your question…. 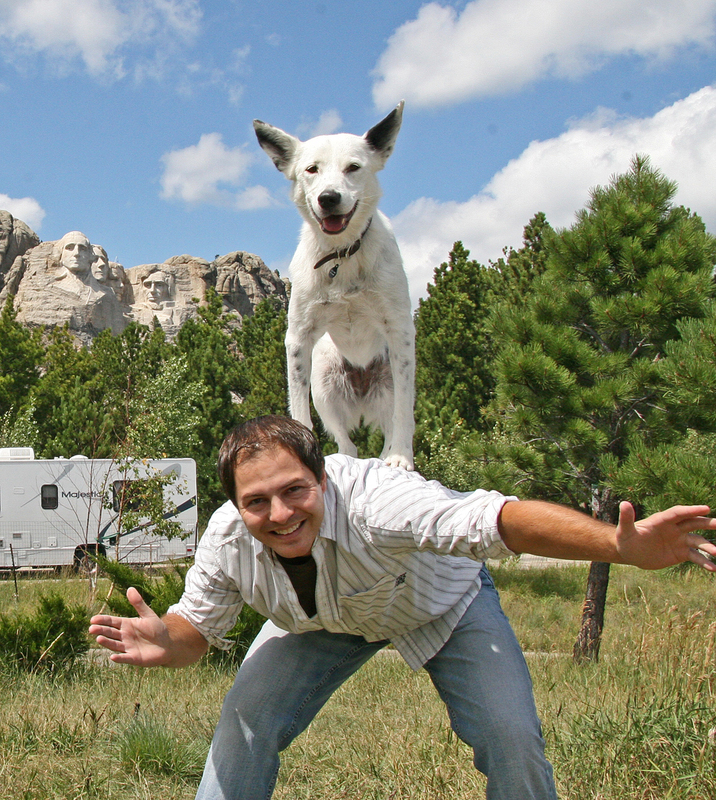 “Is Mount Rushmore dog friendly”? Unfortunately, it is not a very dog friendly place. 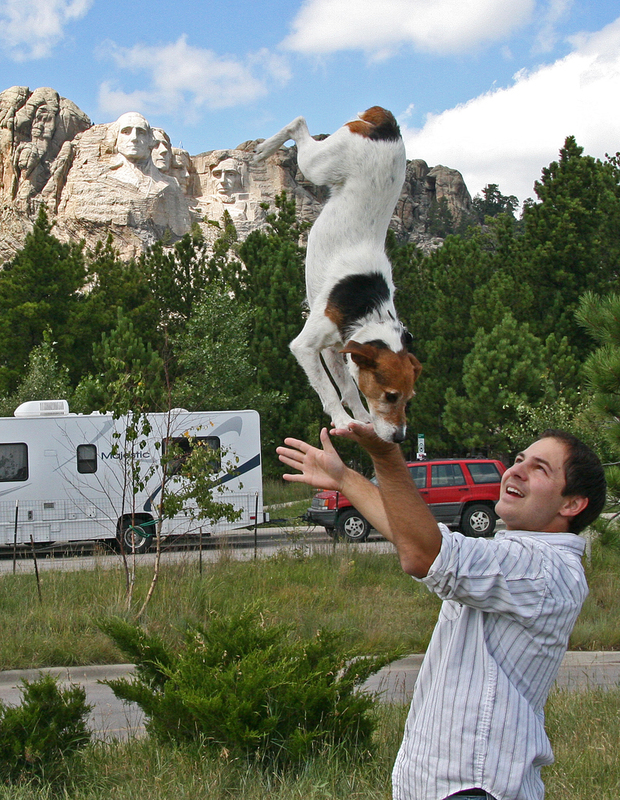 I would not recommend taking your dog to Mount Rushmore if you plan on staying long. We did take a few pictures at the base of the mountain with the dogs. You can see Mount Rushmore in the background, but that is the closest the dogs could get to the monument. I had to leave them to chill and relax in the RV for the remaining part of the trip. They weren’t too happy about it, but I made it up to them at Bear Mountain U.S.A in the Black Hills. 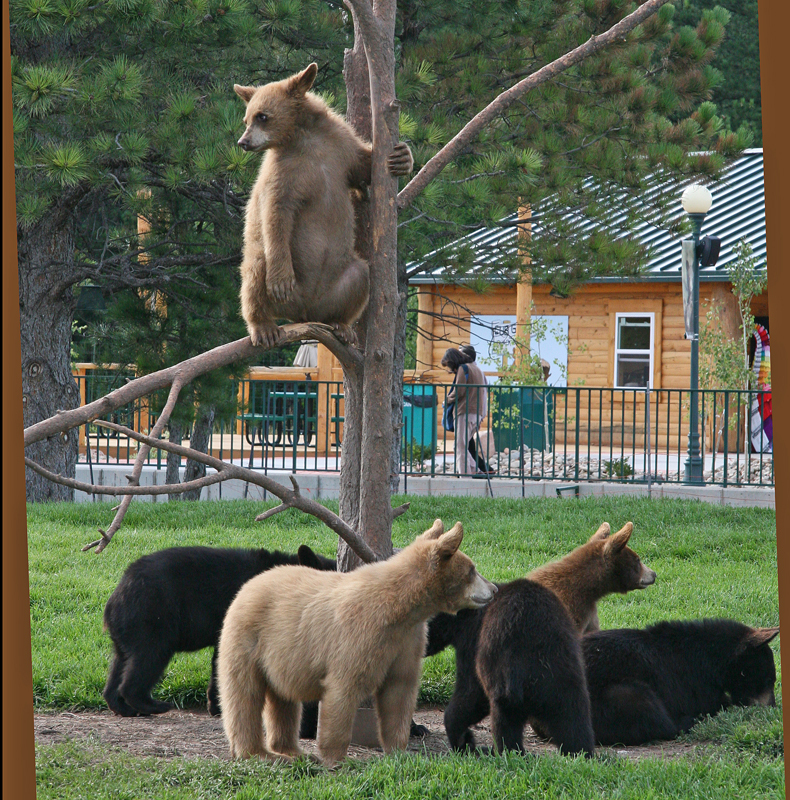 This is an amazing wildlife park about 20 minutes from Mount Rushmore where bears walk right next to your car and wolves prowl in their habitat as you drive right by them. We were told to keep our windows up and to stay inside our vehicle at all times. Jackson could see the bears, wolves, buffalo, reindeer, and the rest of the critters through the windows in the truck. He whined and barked like he couldn’t believe what he was seeing. After driving through Bear Mountain we parked in the RV lot at the end. They had a huge grass field adjacent to the parking area. So I took all the dogs out to stretch their legs, run, and play. Some of the staff even came out to watch. I’m currently half way to New York, making a pit stop just outside Chicago. Next stop is the great New York State Fair! ← The Greatest Stunt Dog Show on Earth! Gla the dogs enjoyed at least part of the trip. I just read your story on Mt. Rushmore and Bear Mountian. Thank you for the information. Thanks for your post. My son and I were going to plan a trip to Mt. Rushmore, but he wants to take our dog on the road trip with us. If it’s not dog-friendly, then we better find another destination. Any suggestions? We live in Minneapolis, MN so we are looking for places that are a driveable distance from us. I am officially boycotting anywhere that doesn’t allow dogs. My dog goes everywhere with me & if they don’t want to allow dogs to walk with me along the trails, they lost my business, and the business of my friends and family. It’s Bear Country not Bear Mountain just so if anyone wants to visit there.